Belgium's foreign minister has said he doubts whether politicians in the Democratic Republic of Congo can bring about a transition to democracy. Speaking after a tour of the country, Karel de Gucht also questioned their ability to end corruption. Elections are due to be held next year - the first since the end of a five-year war during which 3.3 million died. 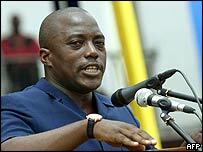 His comments have been criticised by Congolese officials as not helping to increase harmony in the region. Mr de Gucht's visit, part of a week-long tour of Africa is intended to support the peace process in the former Belgian colony. DR Congo currently has a transitional government, led by President Joseph Kabila, and with former rebels in senior positions. "There is a problem with the political class in Congo and Kinshasa, and apparently there are few people who are aware of the historic task and the challenges they are facing," Mr de Gucht told Belgian VRT radio from South Africa. "I have met a lot of people and I wonder if they are the people to transform this country into a democracy and seriously manage it... There needs to be an end to corruption," he added. A Belgian government spokesman declined to comment on whether Mr de Gucht's comments marked a change in policy towards DR Congo, Reuters news agency reported. Can Congo be saved from crisis?